Usage/Application Pharma and Food Industries. Designed and Manufactured to suit critical hygienic conditions of pharma and food industries. Detachable bottom is operated by hydraulic cylinders and held tightly with zero leakage. Offered in various materials of constructions, like stainless steel, carbon steel, rubber lined carbon steel and lead lined carbon steel. Offered in a wide range of filtration area capacities. Significant squeezing of filter cake is possible, there by resulting in considerably lower residual moisture in the cake, resulting in reduction in energy requirement for drying of filter cake by upto 40% depending on cake characteristics. Method of operation is totally enclosed, neat and hygienic. These conditions are excellent for solvent recovery, handling of toxic and hazardous materials without human intervention. Enables easy, non-manual and automatic cake/solid discharge. Scraper blade is provided to scrap the material which may stay on shell. The unit is designed with minimum maintenances feature. 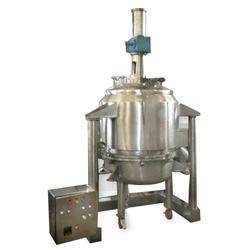 Looking for Agitated Nutsch Filter Dryer ?